The program allows you to create your own map context menu. 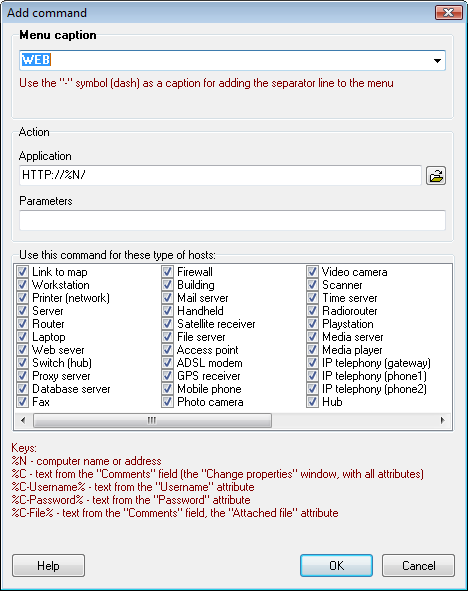 With its help, you can perform various actions and run commands over network devices. This user-defined context menu can also be used through the web interface (in LANState Pro). Fig. 1: The Adding new action window. Below the types, you can see a legend explaining the substitution keys. Specify the %N key for substituting the selected device's address to the Application or Parameters strings. The program will replace specified keys with the corresponding object's parameters and run the application. You may use not only paths for executable files in the Application field. You can specify protocols like "http://%N" and other commands you usually can run using the "Run..." item of Windows Start menu. Specify the %C key for substituting the device's comment field. Thus, you can insert various data (which you can store in the comment field) into the parameter string when running an external application. Specify the %C-Username% and the %C-Password% keys for representing the device's username and password which are stored on the device's properties window. If you want to use the attached file's name from the device's comment properties, use the %C-File% key. The list of the caption field has a number of predefined templates (such as HTTP, FTP, etc), which you can use as you wish. Once you have created a new menu item, it appears on the selected object's context menu in the section Actions. You can modify, add, or delete menu items. Fig. 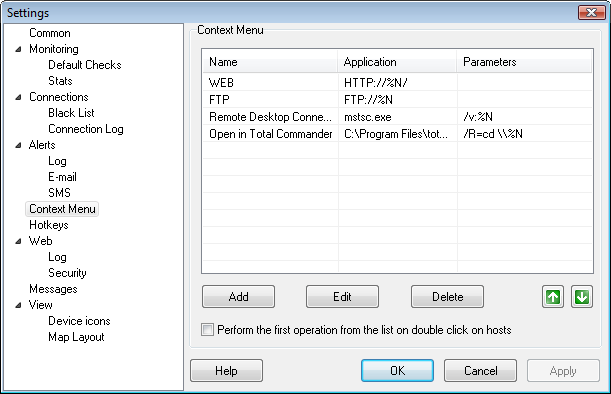 2: The Configuring context menu window. You can sort the context menu items by clicking the arrow buttons. If you select the option Perform the first operation from the list on double click on the upper list item will be the default action. It will be applied to map objects by double-clicking on the necessary object (this is faster than bringing up the context menu and selecting an item). Use the "-" symbol (dash) as a header for adding the separator line to the menu. The configured context menu will be also displayed in the program's web interface (in LANState Pro). However, the menu items which start executable files (in the "Application" column) will work in Microsoft Internet Explorer only (other browsers are not supported yet). 1. Click the Tools | Internet Options menu option in IE's main menu (hold Alt to see the menu if it is hidden). Go to the Security tab. 2. Select the Web content security zone to specify its settings – Trusted sites. Click Sites. 3. On the Trusted sites window, disable the Require server verification (https:) for all sites in this zone option. In the Add this Web site to the zone field, type the program's web server address (http://network-address-of-a-computer-where-the-program-is-installed. For example, http://server). Click Add. Close the window (OK). 4. In the Security level for this zone field, click the Custom Level... button. On the Security Settings window, find the "Initialize and script ActiveX controls not marked as safe" node in the very beginning of the list and select the Enable option. Please note! These security settings are potentially dangerous. If you do not need to run executable files via the context menu in the web interface, do not apply the security settings described above to your Internet Explorer.